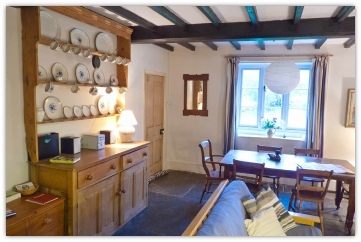 The Lodge Cottage is a Victorian addition to the farmhouse. It was originally built as a hunting lodge for visitors shooting grouse in the Radnor Forest. The living room has a traditional slate floor, wooden beams and a wood-burning stove. 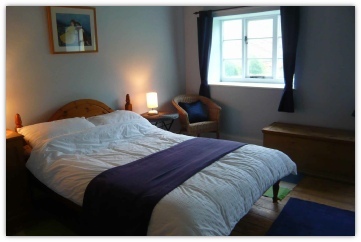 The large main bedroom has south-facing windows with fine views across the valley to the Radnor Forest. There is a smaller bedroom with two bunk beds, and also a comfortable double sofa bed in the sitting room. The upstairs bathroom with has a bath, an electric pump shower above it, washbasin and toilet. There’s a second toilet and washbasin up two stairs from the living room. 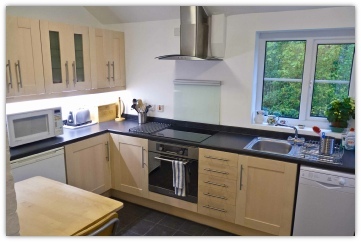 The kitchen is recently renovated and fully equipped, with a built in oven and hob, fridge/freezer, microwave, dishwasher and washing machine, breakfast bar and lovely views.